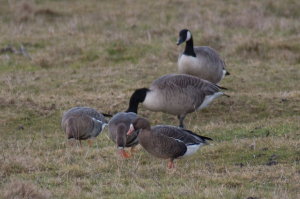 Luckily I was able to make a small route change whilst out yesterday to take in these White Fronted Geese at Broughton Pools near Aylesbury. Two adults and a juvenile. Eurasian race have pink bill whereas Greenland race are generally darker and have orange bill. Significantly smaller than Canada Geese as two of the pics show.